Operating passenger car diaphragms are accurate models of specific prototypes and realistically fill the gap between cars. Easy-to-build kits feature injection-molded plastic parts in black or gray plastic and will not interfere with operation of most couplers. All kits include complete instructions. Designed especially for these modern bi-level cars. 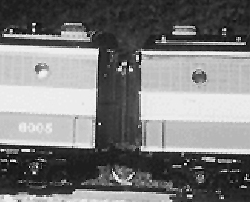 For Rivarossi and Con-Cor heavyweight passenger cars with Micro-Trains(R) 1129 or standard couplers and a minimum curve of 15 inches. Fits Kato, Con-Cor and Rivarossi cars with popular coupler conversions. Operating diaphragms are accurate models of specific prototypes and realistically fill the gap between locomotives. Easy-to-build kits feature injection-molded plastic parts in black or gray plastic and will not interfere with operation of most couplers. All kits include complete instructions. For A-B-A sets (four diaphragms). Kato F units require Micro-Trains (R) #1128 couplers; E units use standard Kato couplers. 12″ minimum radius. For A-B-A sets (four diaphragms). 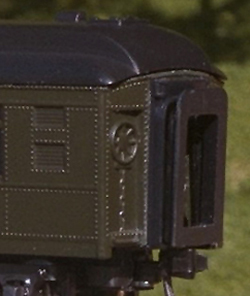 Con Cor PA Diesels require Micro-Trains(R) #1101/ 1102 for powered models, or #1129 for unpowered models.